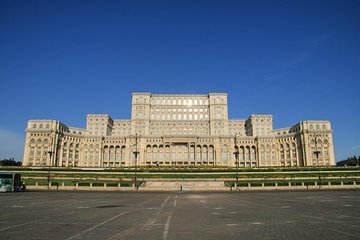 Scopri come 40 anni di dominio comunista hanno scosso la Romania in questo tour di mezza giornata del patrimonio politico di Bucarest. Scopri le nobili ambizioni e la violenta caduta del 1989 del governo comunista durante la visita dei suoi resti più importanti, come Revolution Square, la Casa della Stampa Libera e il luogo di sepoltura dell'ex dittatore Ceausescu. Per uno sguardo eccezionale sugli eccessi del regime, fai una visita guidata allo sbalorditivo Palazzo del Parlamento. Very interesting tour. We were picked up on time and our guide was knowledgeable and flexible. We learnt about communist Romania from an insiders perspective. We were picked up on time at our hotel. Valentin our guide was dynamic and very knowledgeable about Bucharest and the communist era. The tour itself was very interesting. We learned a lot of things and we saw the most important communism-related sites. The visit at the Palace of Parliament was very interesting as well. We recommend this tour. Brilliant. Picked-up spot on time. Valentin was a great guide- very knowledgeable about Bucharest. Palace of Parliament is extraordinary. We had a guided tour which was great and only cost 25 lei. You had to pay extra to take pictures. We would thoroughly recommend this tour to anyone.